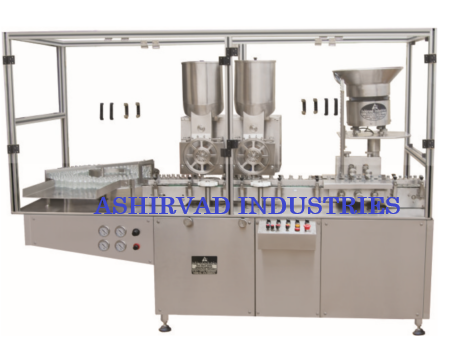 “NO VIAL – NO FILLING SYSTEM “Which reduce the wastage of costly powder. As the Machine is attached with Rubber Stoppering unit, it reduces the space in sterile area & finally the space of laminar flow unit. Multiple dosing systems – with the help of change parts. High accuracy for filling costly powder – (+ or -) 1%. All contact parts are easily removable all sterilization. Production Speed Up to 240 Fills/Min for Single Dose. Up to 120 Fills/Min for Double Dose. Up to 80 Fills/Min for Triple Dose. Power Characteristics 440 volts, 3 Phase (4 Wire System) 50Hz. Depending on neck diameter and powder characteristics. Filling Accuracy + 1 % for depending upon the consistency, uniformity & bulk density of powder under the controlled level of humidity below 30%. Powder wheel adjustable depending to Dry Syrup Powder Filling Machine. Rubber stopper 20 mm. M.O.C. – BUTYL.